At high speed, the front end of the 996 seems a bit light. For cooling purposes, it’s a fairly efficient design: High pressure air enters the openings in the front of the bumper, passes through the AC condensors and radiators, before exiting toward the pavement ahead of the wheels. The design tends to cause the front to lift at high speed, as well as catch leaves, bugs, and debris between the condenser and radiator. 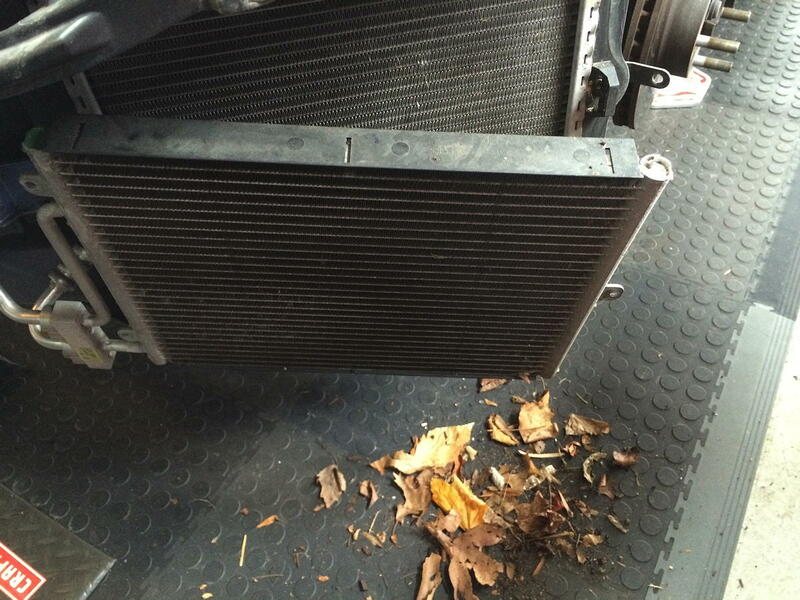 We can’t do much about the leaf problem for now, (except remember to clean the radiators each year,) but we can do something about lift and improve brake cooling at the same time. 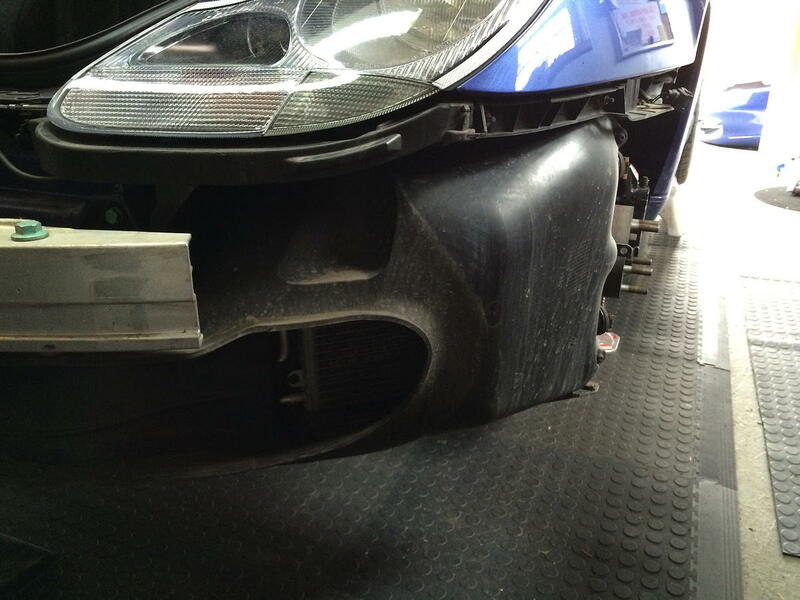 If you look into the front wheel wells of later 997 models, you will see that the air now passes through the radiator and into the wheel well where it helps cool the brakes. The 997 fender liners will not fit in the 996, but you can modify them to get the same effect. This is a fairly easy project that should take just a couple of hours to complete. 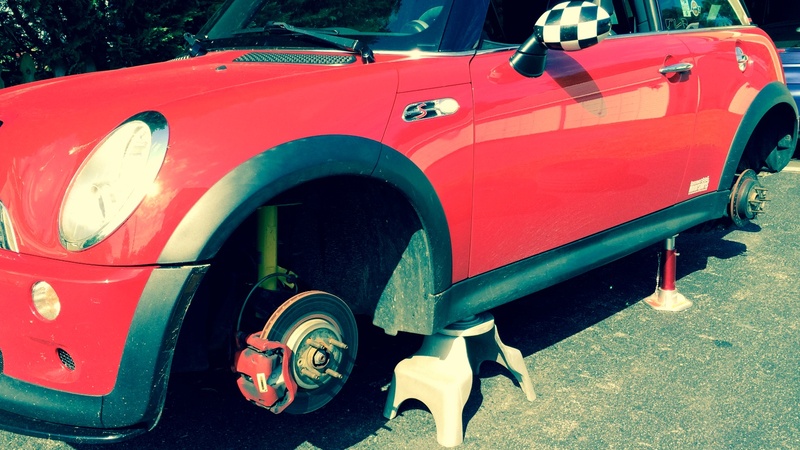 Safely place the car on jack-stands, remove the front wheels, and remove the fender liners. Be careful when removing the plastic pop-rivets as they may have become brittle. Remove the front bumper cover and the shroud around the radiators. 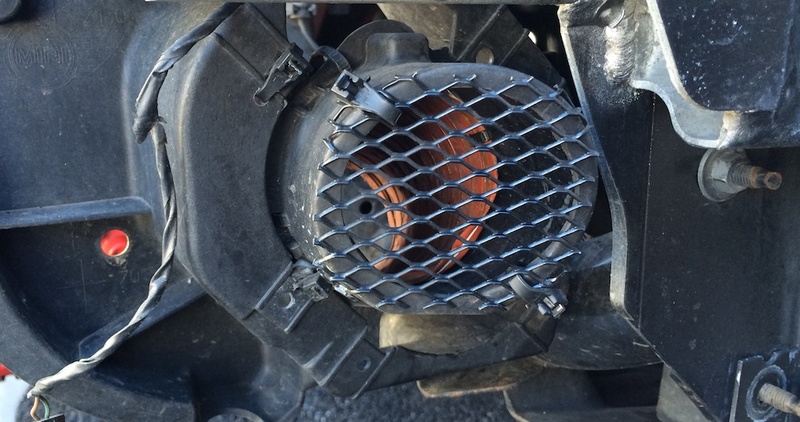 At this point it is a good idea to separate the condenser from the front of the radiator and blow out any debris. You will need to remove the triangular frame so you can pull off the plastic shroud on the back side of the radiator fan on each side. Mark the area you need to cut before you pull it off. Use a dremel tool to cut away the material you don’t need. Line the metal triangle up with the back side of the fender liner and draw a similar pattern. 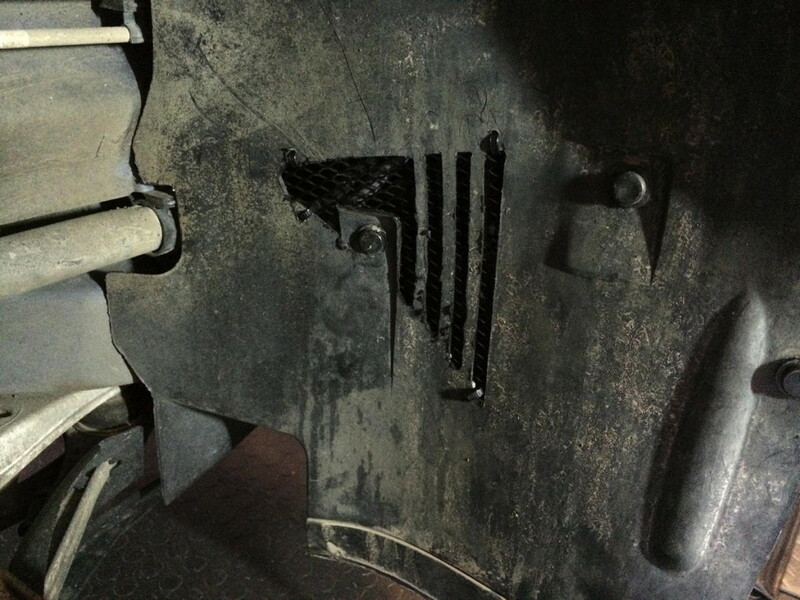 Cut away the material on the fender liner as well. We put a metal screen on the back side, but that’s optional. Don’t worry if your cuts are not perfect. 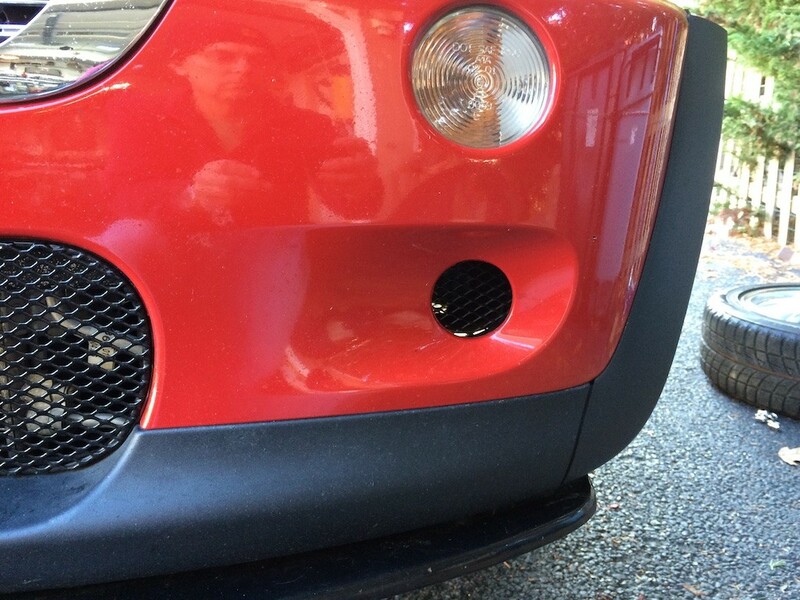 Once the wheel is mounted you cannot see your new vents. You’ll notice a little less floating of the front-end during high-speed straights and get a little better brake cooling as well. Win-win. Make a note to clean out your radiators again next year. Something else to consider is to upgrade the Brake Duct Spoilers while you’re there. Air is channeled under the front of the car and redirected by spoilers attached to the control arms toward the brake calipers. An easy upgrade is to add the GT3 version of this part. The key to this mod is not to use the 996 GT3 spoilers which are about $90 each, but instead use the spoilers from a 997 GT3, which (unusually for Porsche) happen to be priced about $10 each. Part numbers are 997-341-483-92 and 997-341-484-92, left and right respectively. 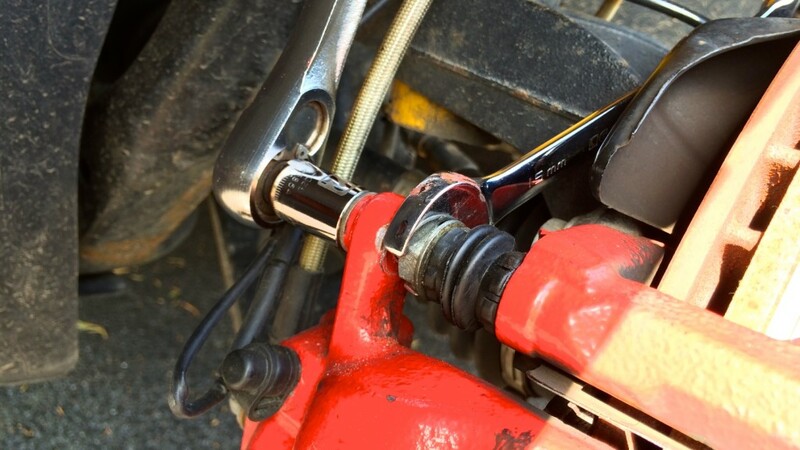 Simple clip on install, but you may want to use a zip-tie or two since it isn’t a perfect fit for your older 996 control arm. Need more? 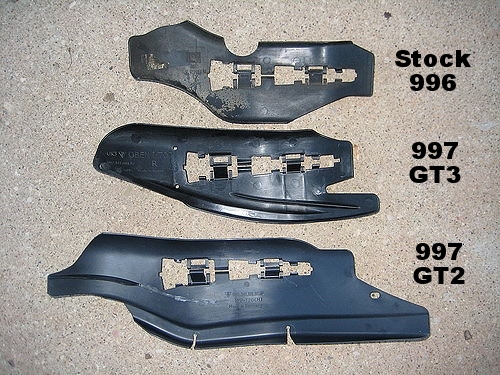 997 GT2 Brake Spoilers are also available, but they cost more than $300 and tend to catch on debris and pavement. 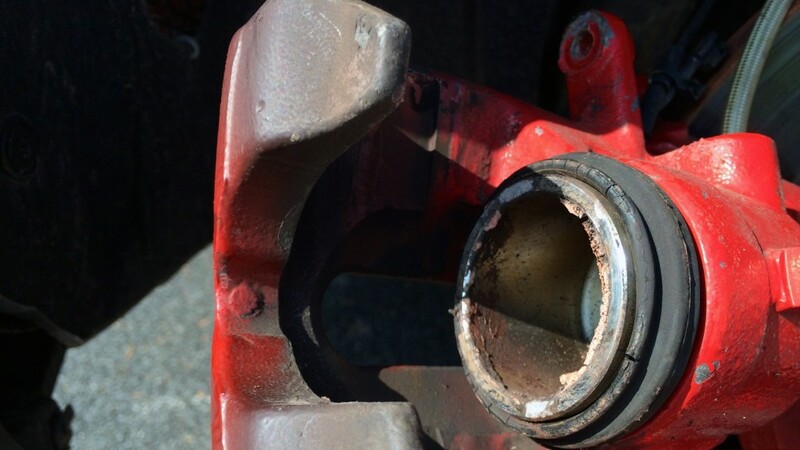 If your brake calipers have had multiple track events where they’ve exceeded 450 degrees or any one event where they exceeded 500 degrees, many brake manufacturers recommend a rebuild. You also want to rebuild if you notice the dust boots have cracked or ripped like the ones in the photo above. Why take the risk of a caliper dragging because klag got past the boot or finding out too late that a seal has failed? It’s a relatively easy, but messy job. Have plenty of towels on hand to clean up. Remember: Brake fluid can ruin your paint. Do not grab a fender with a brake fluid soaked glove hand if working in a confined area. Instructions below are provided for illustration purposes only. As usual, refer to your workshop manual for guidance. Use at your own risk — no wagering. Verify that you have all of the parts on hand before you begin. You will need a caliper rebuild kit and a bellows repair kit for each caliper. (On the first generation MINI, only the front calipers can be rebuilt.) You will also need replacement crush rings for the brake lines (2 per caliper), and since you will have to bleed the brakes, you might as well flush and replace all of the brake fluid. (Consider high temperature brake fluid if you track your car often.) It is critical that you not let the brake fluid reservoir run dry while you do this job. Modern brake systems are very difficult to purge if you allow air to get all the way to the reservoir. This would be an excellent time to change the brake pads and rotors as well. (This DIY only covers the caliper rebuild. See this old post for changing pads.) Expect this job to take 60-90 minutes the first time you do it. 1. Safely jack the car and remove the road wheels. 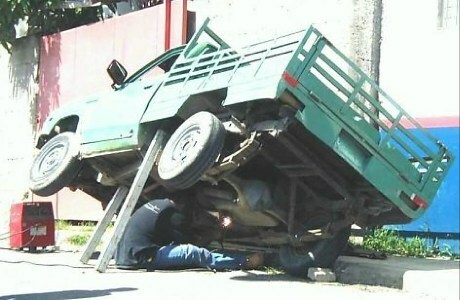 Never work on a car supported only by a jack or one that is not fully supported by jack-stands. 2. Remove the caliper from the carrier. Note any cracking or damage to the bellows jackets of the caliper pins. 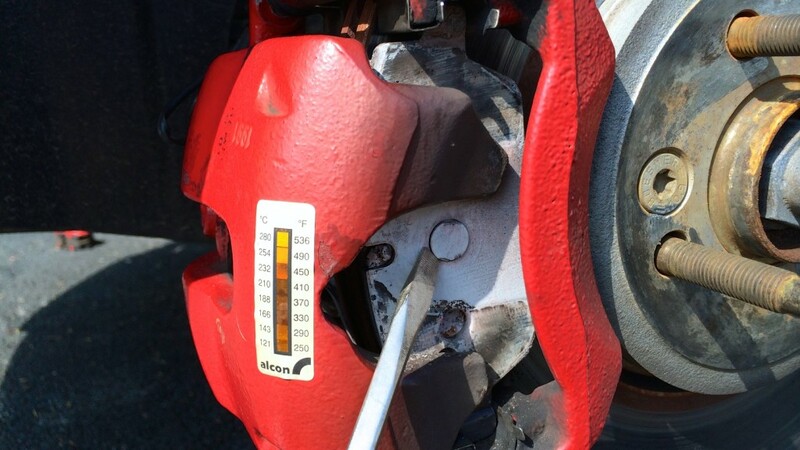 This is a also sign the caliper has seen some serious heat cycling. 3. Note the type of brake pads in use. These Carbotech pads have a pin in the center that won’t allow the caliper to be slid off of the rotor until the piston is slightly retracted. If you pads are shot, just use a screw driver to carefully pry between the pad and the rotor to create clearance, but if you plan to reuse the pads, then carefully apply pressure directly to the piston to make room. Be careful to not damage the surface of the piston. Notice also the Brake Caliper Temperature Strips. This is a great way to keep track of the max temperature sustained by the caliper. 4. Hang the caliper so the weight is not supported solely by the brake line. 5. With the caliper off, inspect the rotor for excessive checking, cracking, or deep grooves. Replace as necessary. 7. Carefully empty any remaining fluid from the caliper and inspect the dust boot. If it looks like this one, replace and rebuild the caliper. 8. 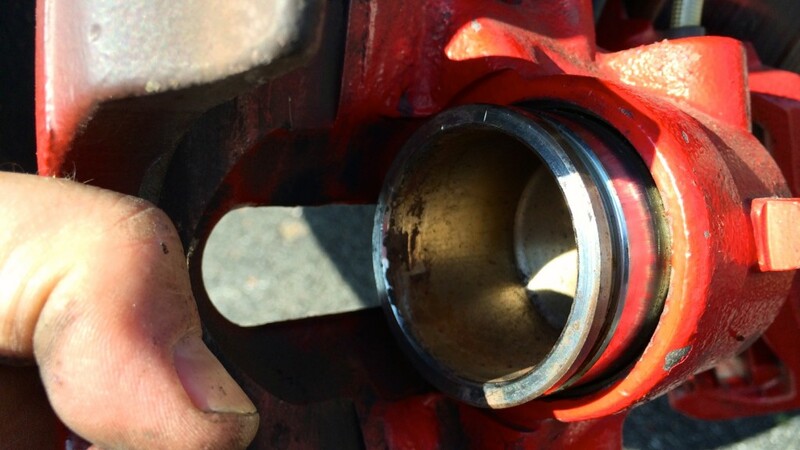 Once the boot is removed, check the piston for debris and damage before proceeding. 9. 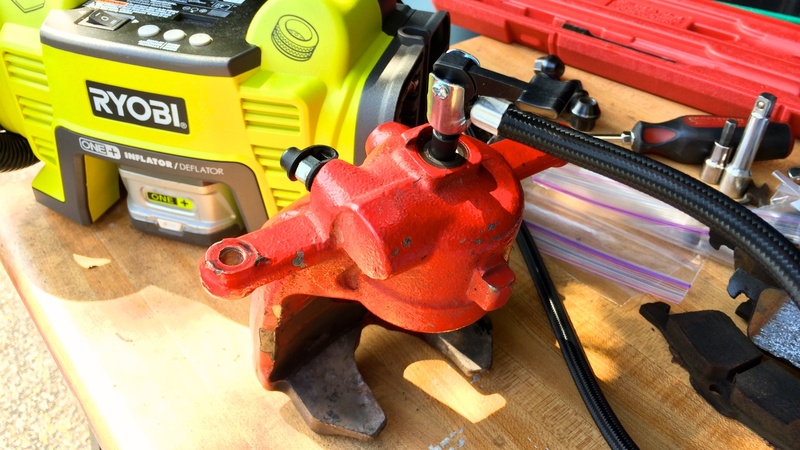 Place the caliper on a workbench and use an air pump to push out the piston. 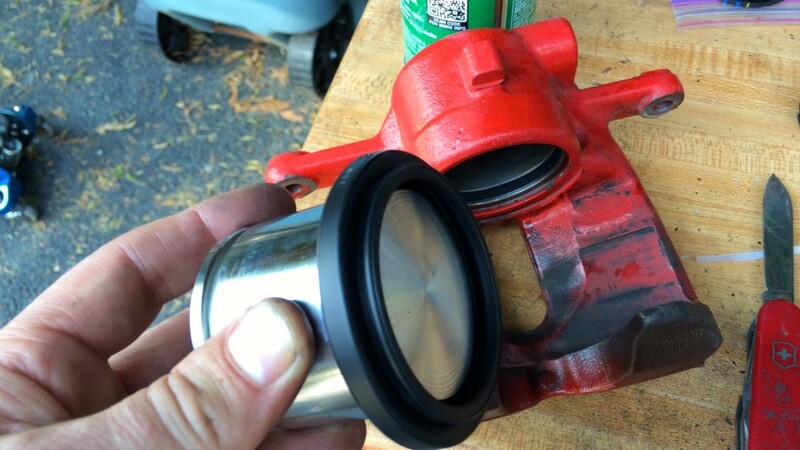 Place a towl under the piston to catch it as it comes out. Do not use excessive air-pressure or you will shoot the piston from the caliper. 20 lbs was enough to slowly release this one. 10. 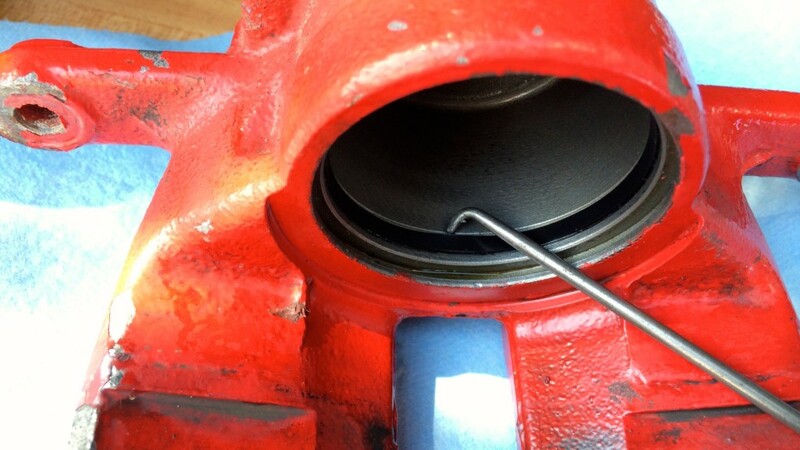 Inspect the piston and the chamber before proceeding. Remove the old seal and inspect it for damage. Ensure the new seal is the same size and thickness. 11. 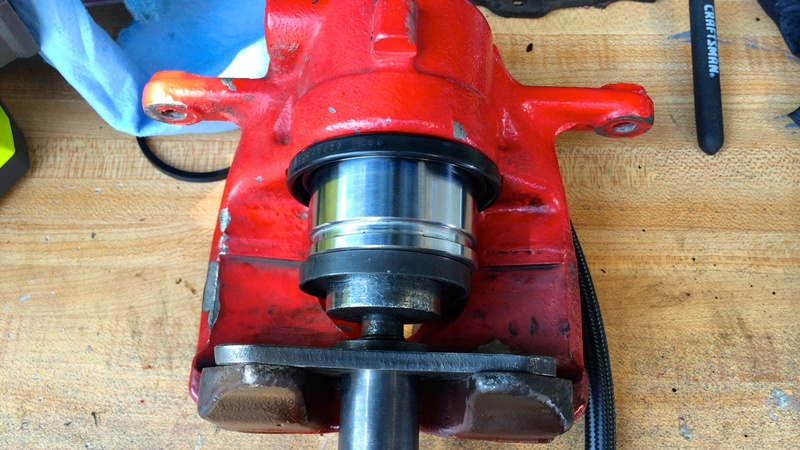 Once you’ve cleaned the piston and the caliper chamber, seat the new seal ring. 12. Push the new dust-boot so the end that fits into the groove on the caliper is exposed and can be fitted before the piston slides in to the chamber. 13. Engage the boot seat into the caliper and then slowly push the piston back into the caliper until the dust-boot engages in the slot at the far end. 14. 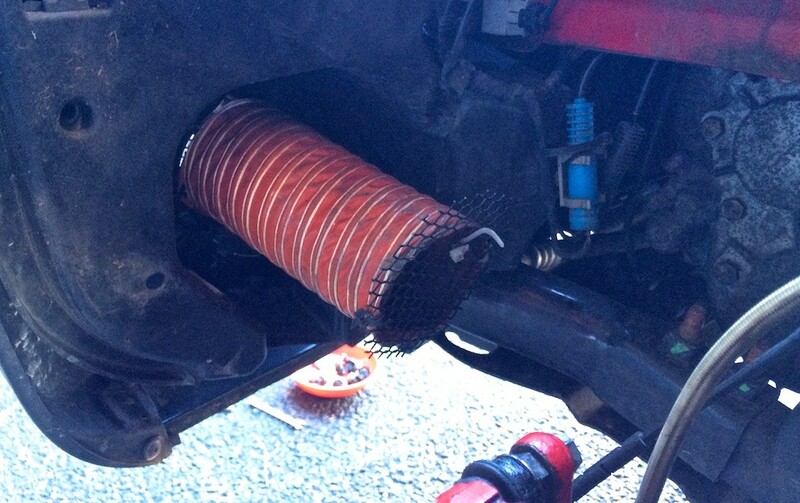 Reattach the brake line using new crush rings. Use hangars to support the calipers again. 15. 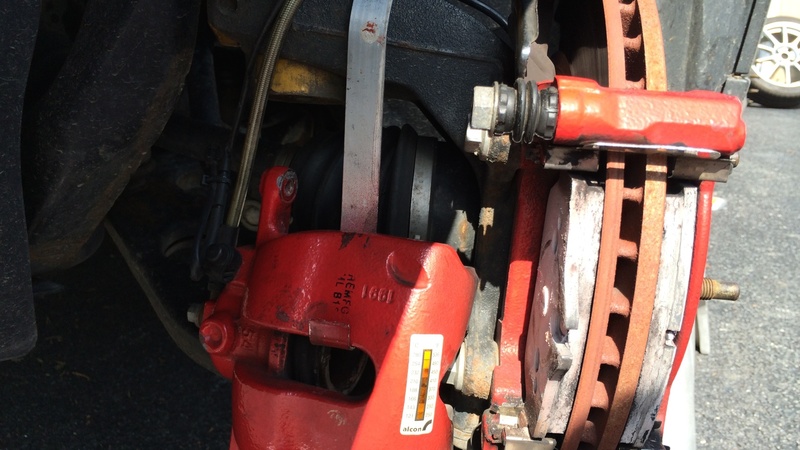 Reinstall/replace the brake pads. 16. If it hasn’t been contaminated, pour the brake fluid from the bag back into the brake reservoir, otherwise top off your reservoir with fresh fluid before bleeding. 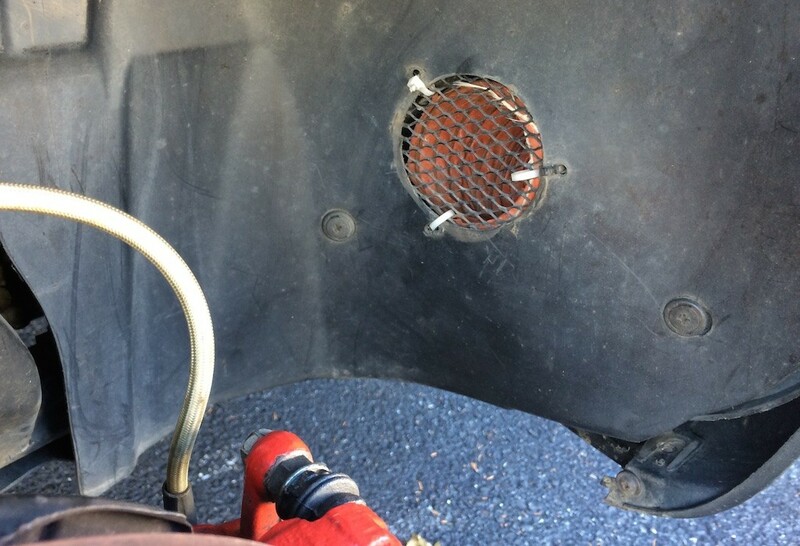 Be sure to top off before starting to work on the other side as you DO NOT want to allow air past the reservoir. 17. 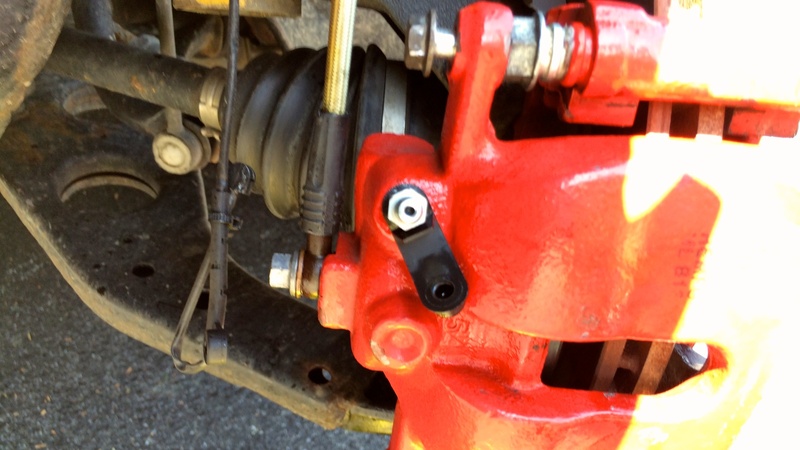 Bleed the brakes according to your workshop manual once booth calipers have been rebuilt. 18. Torque banjo bolts and caliper bolts according to workshop manual specs. 19. Once both calipers have been rebuilt and reattached, bleed the air from the brake system and replace fluid with new. Armed with my trusty Bentley manual and the internet, I decided to learn how to change my own brake pads. The dealer charges somewhere north of $400 for pads and labor so I thought I set out to get a higher grade pad and to do it for less money. To start with — the pads. I decided to go with the Hawk HP Plus pads. I had read several good reviews that claim they offer increased stopping power, lower temperatures, and less dust. And they would hold up to occasional track use. There are several good pad changing guides on the internet; I suggest you read several along with the Bentley manual before you begin. The process is really quite simple (once you get past the fact that if you screw up, you aren’t stopping….) Consider upgrading to higher temperature brake fluid if you will track the car often. Disclaimer: This guide provides an overview and is not a substitute for common sense. Use at your own risk. 1. Chock your wheels and loosen the lug bolts and get the car up on jack stands on a flat, level spot with plenty of room to move around the car. 4. Remove the wire retaining clip by prying up at the bottom with a screw driver; remove the two caps and 7mm hex bolts that hold the caliper to the carrier. 7. Remove the inside pad by pulling it toward you. 8. Remove the wear sensor wire (left front, right rear). If you haven’t worn down to the sensor, no need to replace it. Just be careful when you pull it out so you don’t break it. 9. 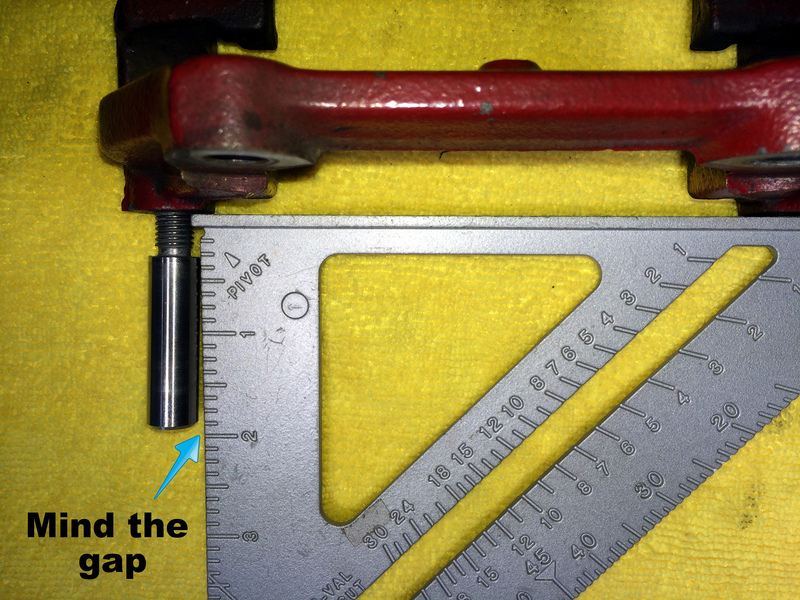 Compress the piston (a special tool helps, see below.) The front ones just compress, the rears compress and turn. Inspect the rubber boot for damage (See this post for rebuilding the calipers). 10. Clean the calipers and the piston with a wire brush. Do not damage the dust boot. 12. Put the new inside pad into the piston opening (be sure not to touch the surface of the pad with your fingers or with any Plastilube) and attach the sensor wire. 13. Put the new outside pad into the carrier. 16. Replace the wheel and tighten the lug bolts (80 lbs. or so). 17. Repeat 1-16 for the other 3 wheels. 20. Before you remove the chock block, start the car and step on the brakes repeatedly. They will go to the floor. Repeat and you should feel the car adjust and the brakes return to normal feel. 21. Check the emergency brake, it should now grip. 22. Check brake fluid level and top off if necessary. 24. Drink beer when you get home (optional). 1. It’s a messy job. 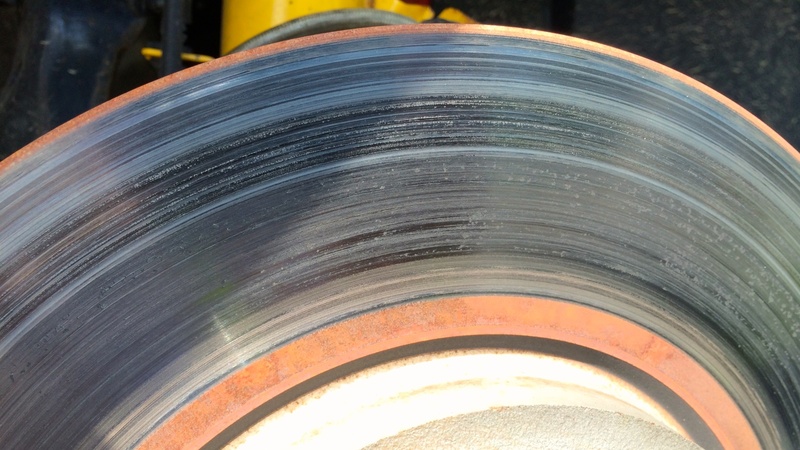 Brake pads do not contain asbestos any longer, but you should still avoid breathing brake dust. Do not use compressed air. Consider wearing gloves. 2. 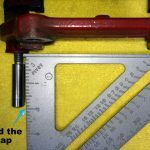 You can get a piston compression tool for about $40. I used this one. 4. 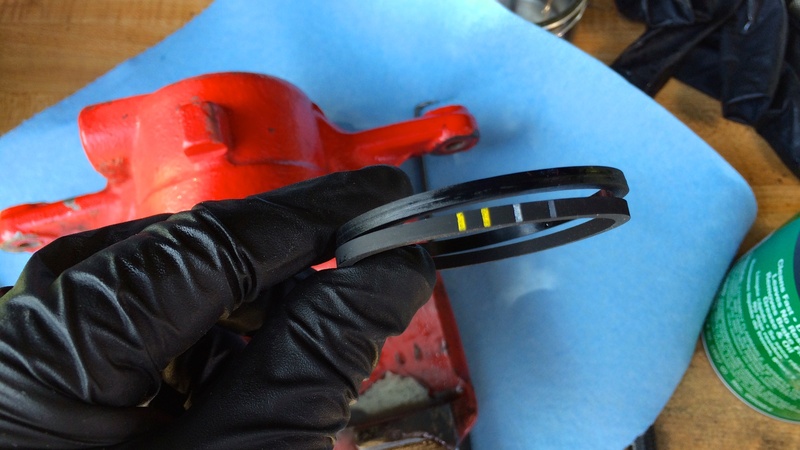 If you brake wear sensor light was lit or you see that the sensor wire was damaged, you should replace the sensor wire. 5. Check your new pads for the slot for the sensor wire before you begin. If you do not use the wire, just tie it back with zip ties, but remember that you will need to check your pads for wear. 6. If you have topped off your brake fluid recently, remember to remove some before you press the pistons back into the calipers and place a rag around the reservoir to catch any spills if you push any out. Remember to top off when done. 7. And whatever you do, don’t be this guy…. What was the cost? I suppose it depends on how you add it up. The jack was a sunk cost and the jack stands were borrowed from my neighbor. The caliper tool was $40. Plastilube was $8. New pads $248. Turkey baster used to remove brake fluid was $2. New brake fluid was $17. Total $315. It took me about 3 hours to do the work. The first wheel took over an hour; the second about 45 minutes; the third about 30 minutes; and the fourth about 20 minutes. I think I could do four wheels now in under 90 minutes. I think I finally solved a nagging problem I’ve been having with my right rear brake caliper. The right rear brake always ran hotter than the left. 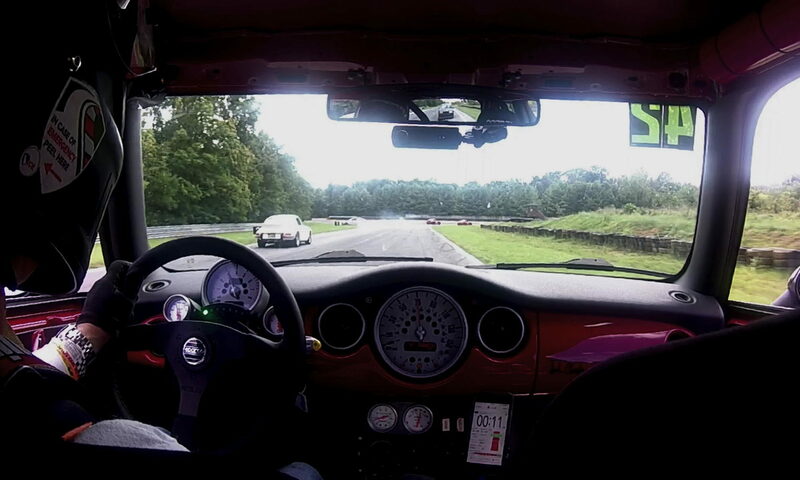 In normal city driving, it wasn’t a big problem, but at the track, that meant I would cook the brake pads at the end of a long session. It was all the more confusing because I was at Summit Point main and that’s the unloaded side. I replaced the brake caliper thinking the piston wasn’t retracting and that didn’t help. I disconnected the emergency brake cable thinking it was somehow binding under suspension compression and that wasn’t it either. Pressure was good and the brake line was unobstructed. It was perplexing. While changing brake pads last weekend, I noticed the brass bushings had seized. Not only that, but they had seized in two different positions, as if under a very strong twisting force. Then I realized, the one thing I hadn’t ever checked was the brake carrier. 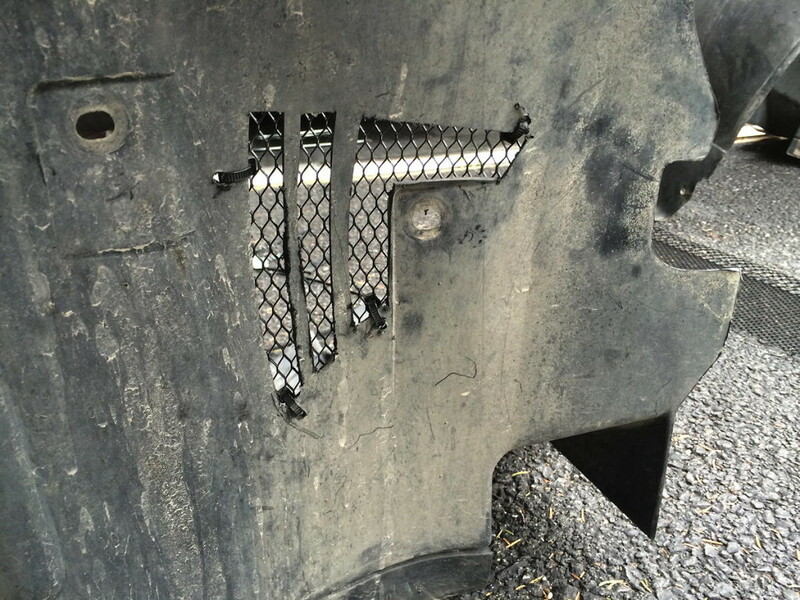 At first I thought maybe one of the posts was cross-threaded, but sure enough the carrier itself was bent. It’s bent. Dang. 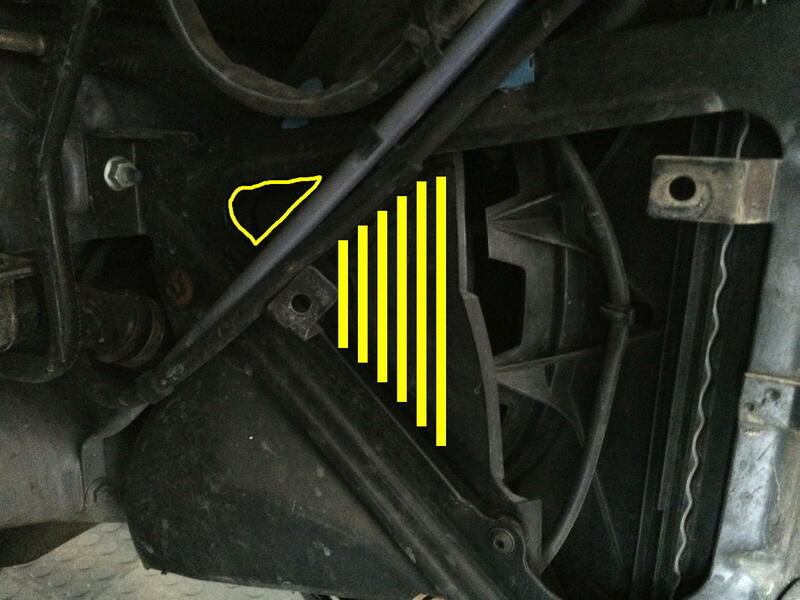 The direction of deflection made it difficult for the caliper to move once brake force was released. This would cause the inside to remain in contact with the rotor causing increased heat and wear. I installed a new carrier and no more heating problem. The piston retracts, and the inside pad moves away from the rotor again. So the question now is why did it bend? It was binding because the brass bushings allowed no room for play, but did the bushings somehow cause the bending or was it just a manufacturing defect? For now I’m running OEM rubber bushings, but will keep an eye out for future temperature spikes when I head back to the track this coming weekend.